Join us on September 20, 2019 at Maggiano’s Italian Restaurant for our next MHSM Friday Luncheon Series with guest speaker Dr. Gene Kopelson, who will be discussing his book Reagan’s 1968 Dress Rehearsal: Ike, RFK, and Reagan’s Emergence as a World Statesman. Gene Kopelson is national Trustee of the Theodore Roosevelt Association, a published historian, an active Churchillian, and a holocaust educator. Kopelson’s book has received rave reviews from Secretary of State George Shultz, Attorney General Edwin Meese, numerous Reagan and Eisenhower historians, The Washington Times, The Weekly Standard, The New York Post, The Daily Caller, The Daily Wire, and Newsmax. Further details are at GeneKopelson.com and at amazon.com. Reagan’s 1968 Dress Rehearsal: Ike, RFK, and Reagan’s Emergence as a World Statesman tells the inspiring, never-before-told history of Ronald Reagan’s first quest for the presidency in the late 1960s. Reagan’s goal was to prevent a Nixon first-ballot victory. Gene Kopelson reveals the brand new history that behind the scenes, Reagan had a hidden mentor on domestic politics and on world affairs: former president Dwight Eisenhower. And Reagan’s public political foe was Robert F. Kennedy. “Ike and Dutch: Mentor, Protege, and Common Sense” is Kopelson’s book talk, in which audioclips, previously lost to history, reveal presidential candidate, and later President, Ronald Reagan discussing the critical importance of Eisenhower’s mentorship of Reagan in world affairs (Vietnam and much more), which extended through the end of Reagan’s presidency and beyond. 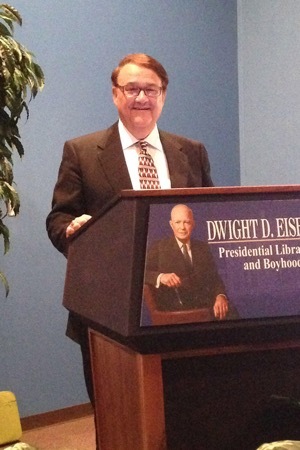 Kopelson has spoken at the Dwight D. Eisenhower Presidential Library in Abilene, Stanford University’s Hoover Institute, The Heritage Foundation, The Ronald W. Reagan Society at Eureka College, the U.S. Army War College, The Naval War College, and The Institute for World Politics. CSPAN recently filmed his book talk and made it part of their American Presidency series. Dr. Kopelson will have copies of his book on hand for purchase and signing. Please note that payment for books will be available by cash or check only.